Opportunities available in St. Louis, Missouri for St. Louis-based chemists with HPLC experience using Waters’ Empower software (admin-users, super-users, users). These openings are permanent, full-time positions with excellent benefits on the 1st or 2nd shift. Missouri Analytical Labs has been in business nearly 50 years performing pharmaceutical analyses within a challenging, fast-paced cGMP environment. The work is interesting and varied, as testing is performed on a multitude of products using USP & client methods. We have an excellent track record with regulatory agencies and clients — and have never had a lay-off. Missouri Analytical Labs is an independent testing lab located in a vibrant, downtown St. Louis district. We only hire permanent, full-time employees and offer a competitive salary with excellent benefits. In nearly 50 years in business, we have never laid off an employee. One of the most popular outreach programs sponsored by the St Louis ACS section is Chemistry is pHun! Sheryl Loux, who runs this program unopposed (kind of like most of our elections) in West County school districts, is seeking a retiree to take over this rewarding program or to offer programs in far-flung school districts. If you are interested in early science education, you can make a huge difference; please contact Sheryl J Loux by email, sjloux@gmail.com or phone 636.237.5149 to discuss. Training is available. The twenty-four Chemistry is pHun programs in calendar year 2014 — all given by Sheryl — have impacted 822 students in 10 or more schools. Program activity for the 2014-2015 school year has started strongly this fall. The program modules offered by Sheryl are “States of Matter”, “Chemistry is pHun”, “What is Matter?”, “Using the Scientific Method for a Science Fair Project”, and “Polymers are Marvelous Molecules”. Sheryl thanks Don Sartor and Amy Kerkemeyer for helping with some programs. 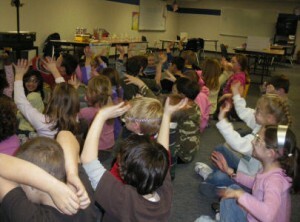 The “States of Matter” program is designed for elementary students and is popular in 2nd- and 3rd-grade classes. States of matter are explored with solid, liquid, and gas states of mainly water, demonstrating the addition or release of energy in the form of heat when changing physical states. Examples of plasma are mentioned and “Gluep” is made to show a substance that has properties of both liquids and solids. Another program for grades K-3 is “What is Matter?” introduces the periodic table of elements and has kids constructing water molecules with marshmallows and toothpicks. “Using the Scientific Method for a Science Fair Project” is designed for grades 5-8. 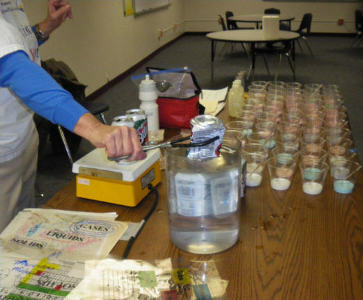 “Polymers are Marvelous Molecules” includes DNA extraction from strawberries, and is suitable for grades 7-12. Of the 822 students participating this calendar year, 610 students enjoyed the “States of Matter” program, 160 students have enjoyed the “Chemistry is pHun” program, and 52 students extracted DNA in the “Polymers are Marvelous Molecules” activity. 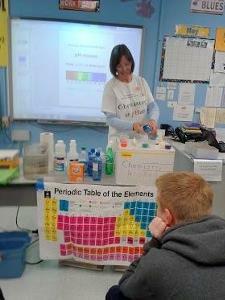 ”Chemistry is pHun” for eighth graders demonstrated by Amy Kerkemeyer (shown) and Sheryl Loux (program Coordinator). Kids having fun and learning; is there a better way to spend a day—for them or for you?